Current OSHA standards for noise levels in the workplace require that workers exposed to an average of 90 decibels, about as loud as truck traffic, for eight hours, wear hearing protection. When the volume increases by five decibels, according to OSHA’s measurements, the noise dose is doubled, so the permissible exposure time is cut in half. In other words, if the noise level reaches 95 decibels, the maximum exposure requiring hearing protection is four hours. 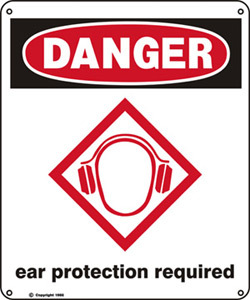 Higher noise levels, even with hearing protection, are considered unacceptable and unsafe. Though one might think that factories with heavy machinery would be the most common workplaces where high noise levels are found, but places such as restaurants, gyms, and bars also have high levels of noise that can take a toll on workers who spend many hours in those environments. Yet OSHA says that they rarely receive complaints from workers in these establishments. One reason for this may be that workers are unaware of the damage these noise levels can do to their hearing. Another problem in dealing with this situation is that the federal body that was specifically in charge of overseeing environmental noise enforcement, the Office of Noise Abatement and Control, lost its funding 30 years ago. Besides the lack of enforcement, there is some question as to whether the noise standards currently in effect for the United States are adequate. Most comparable countries have tougher standards than the U.S. Professionals in the hearing health field are agreed that the limit on safe noise levels should start at 85 decibels and the standard for double doses should be 3 decibels rather than the 5 decibels that is the current U.S. measure. In a restaurant which on a Saturday night might have a 99 decibel noise level, the exposure time would be limited to 19 minutes under the tougher standards. In 2010, OSHA announced plans to institute a requirement that employers soundproof noisy workplaces in addition to providing hearing protection, because the agency said that too many workers were being harmed by loud noise. However, a month after OSHA proposed the new guidelines, it withdrew the proposal, due to opposition from the National Association of Manufacturers and the United States Chamber of Commerce, which argued that the guidelines would be too expensive for employers to meet. OSHA has an eTools section on their website entitled Noise and Hearing Conservation at http://www.osha.gov/dts/osta/otm/noise/index.html . eTools are interactive, web-based training tools on occupational safety and health topics. The section on Noise and Hearing Conservation includes detailed information which is valuable to both workers and employers, and covers the health effects of noise, what the standards are for safe noise levels, evaluating noise levels, and creating an effective hearing conservation program that will provide a safe environment for workers.